The break in the humidity was nice this weekend. Unfortunately the front that brought us the relief also brought excessive rainfall last Thursday and Friday. As we get ready to welcome in another month, it also appears as if we'll be welcoming in another round of heat and humidity. Dew point temperatures will warm from the 60's into the 70's, possibly middle and upper 70's, by Tuesday afternoon and evening. High moisture will remain in the atmosphere until Thursday night when a cold front comes through. Unfortunately, with the higher moisture content any storms that do develop could produce heavy rainfall. A ridge of high pressure will develop over the central United States as weak low pressure systems ride over top the ridge. This will bring a chance for storms Tuesday morning, and again during the afternoon. A weak cool front slides closer Wednesday which will keep a chance for storms during the afternoon. Heads up for the start of the Ogle County Fair. By Thursday the front will push back north bringing highs possibly into the low 90's. By Friday, a cold front comes through with temperatures back near seasonable (low 80's) for the upcoming weekend. 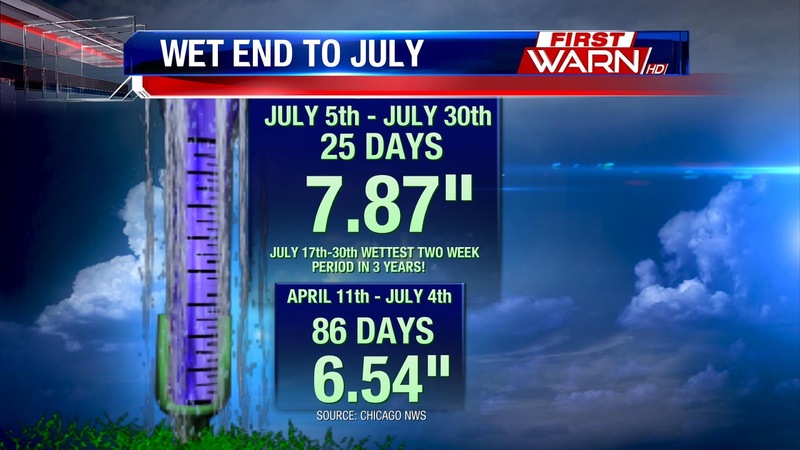 Overall, the summer has been pretty quiet with regards to rainfall and severe weather. It's only been within the past few weeks that we've ramped up in both of those departments. The first five days of the month were dry, but after that Rockford received 7.87" of rainfall to round out the end of the month! This bumped our monthly total 3.92" above the monthly average! What's even more impressive is we've received more rainfall in the past 25 days than we have over the past 86 days, dating back to April 11th! Why is August Called Dog Days? A very common phrase in meteorology is the "Dog Days of August." That is used to imply that August is typically a very hot and oftentimes humid month. And that is a true statement for a good chunk of the country. 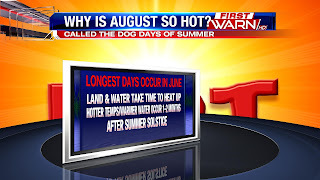 So why exactly are both July and August so hot when the longest days occur in June? It's a phenomenon referred to as seasonal lag, or thermal lag. 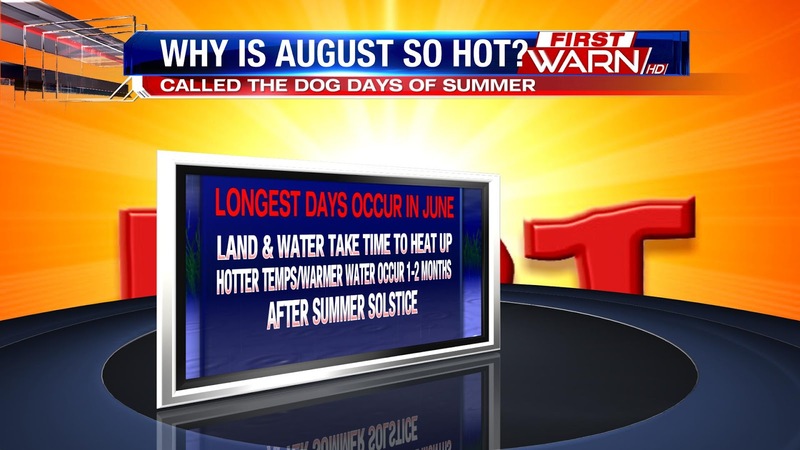 Essentially what that means is that while the longest days occur in June, the hottest days occur 1-2 months later. The reasoning behind the phenomenon is actually a simple scientific principal most of us learned back in basic science. Both land and water take time to heat up. When the longest days occur in June and the solar insolation strikes earth's surface, it doesn't immediately result in warmer temperatures. It takes time for both land and water to see the sun's heat warm them up. There's essentially a lag that occurs. The same is true for the atmosphere. The sun's insolation doesn't immediately cause the atmosphere to heat up. It takes time for heat to warm things up. That's why the hotter temperatures occur in July and August as the graph above shows. The blue curve is the sun's insolation and red curve represents the actual temperatures. That's also why going to the beach along the east coast of the United States may be more enjoyable in July, August and even September. The water is finally "heated up" by those months after the sun's insolation warmed it during May and June. 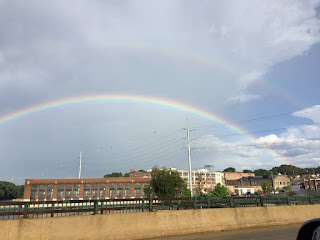 How Much Rainfall in July? If you think July has been abnormally wet, especially over the last week or so, you are absolutely correct. 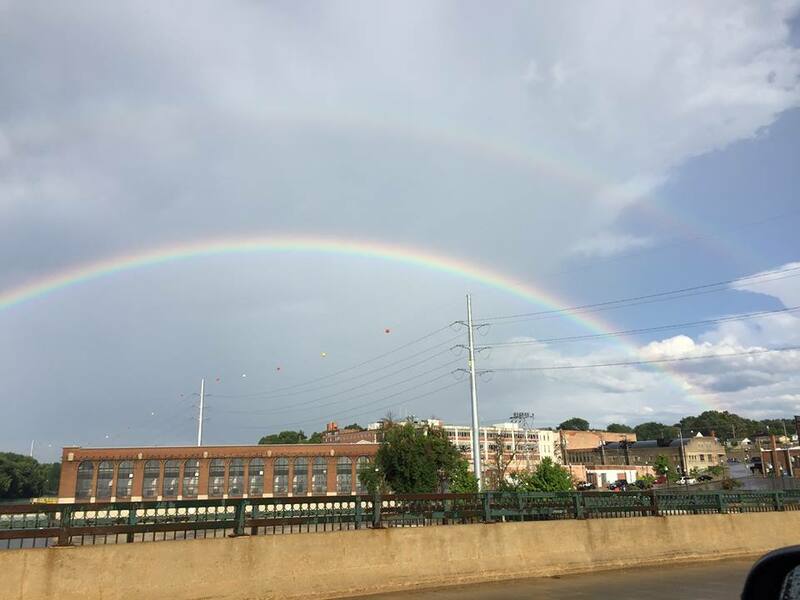 The month wasn't too terribly wet early on, but the last several days have featured rounds of rain and storms that dumped inches of rainfall in many locations throughout Illinois and Wisconsin. In fact, Friday's rainfall totaled 4.65" in Morrison, which is located in Whiteside County. 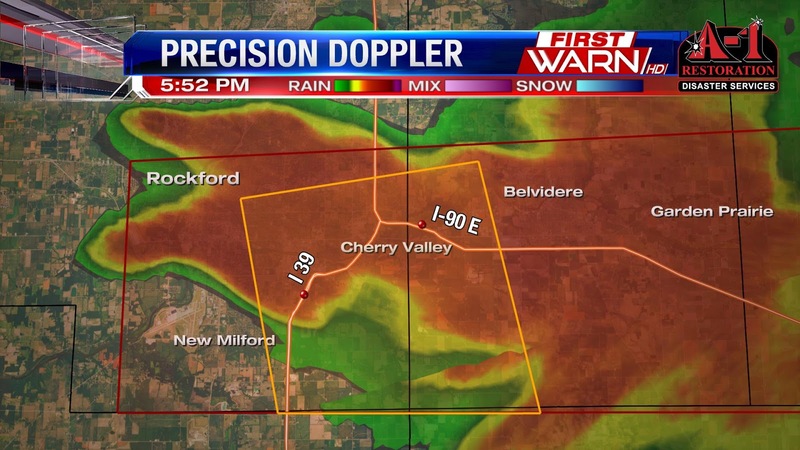 An area just southeast of Rockford reported 2.62" of rain in just two short hours. 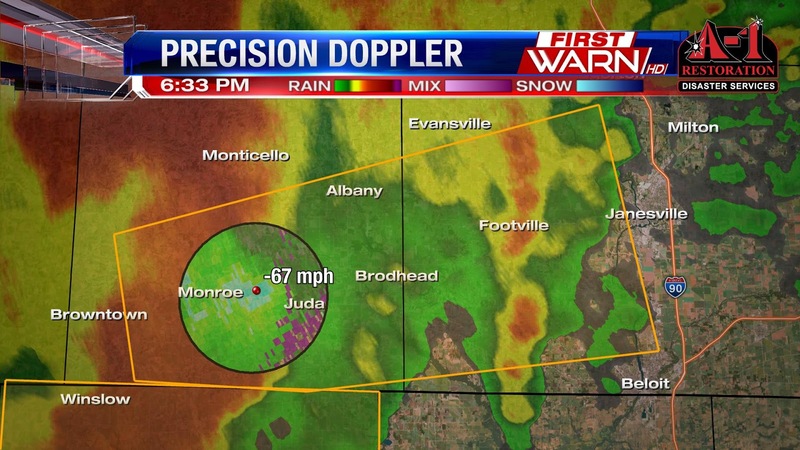 These are two locations that saw storms for a few hours. 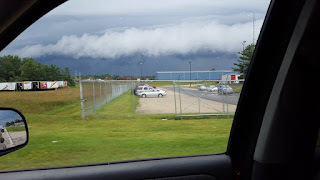 There simply were no upper-level winds in place to steer the storms. As a result, they didn't move much at all. 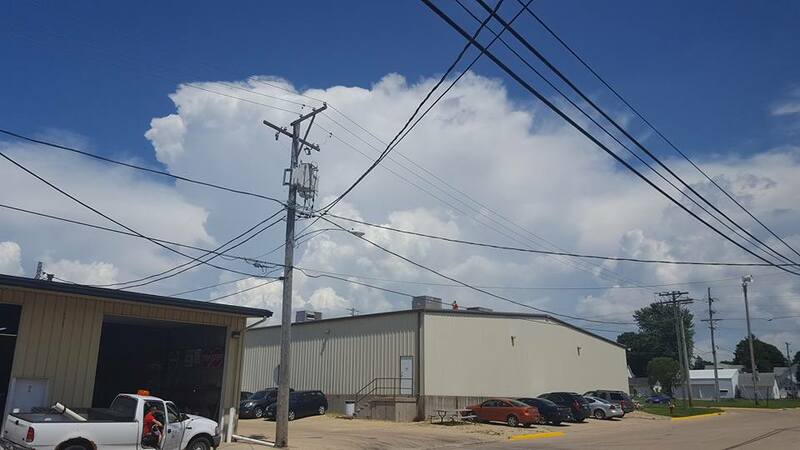 That, along with high moisture levels, led to heavy rain producing thunderstorms sitting over the same areas for an extended period of time Friday afternoon. From the 21st of the month through Friday the 29th, Rockford has recorded 4.96" of rainfall. 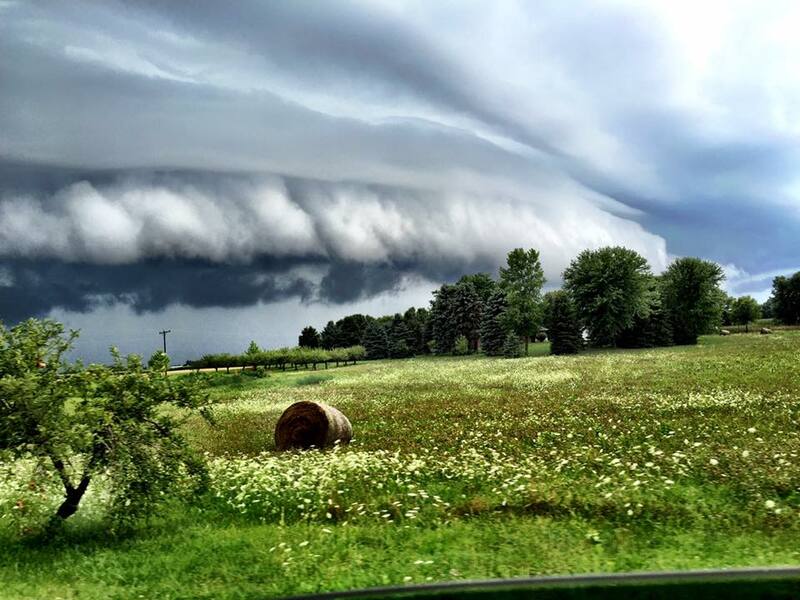 The month of July as a whole has featured a whopping 6.93" of rainfall. That puts the city at a 3.39" surplus in the rain department this month. 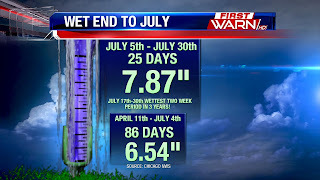 This comes after June ended more than 2.00" below normal. Essentially, July has been the polar opposite of June in terms of rain and thunderstorm activity. That trend will continue on Saturday, but drier weather looks likely for the last day of the month on Sunday! We get a bit of a break from the heat this weekend with temperatures actually below average in the upper 70's and low 80's. A trough in the atmosphere is keeping the cooler temperatures around along with periodic showers and storms. More storms in the forecast for Friday, though mainly we will see shower activity. The coverage in any rain however will be less than Thursday, though could still see areas of heavy rain. Showers will continue this evening but will begin to diminish with just a few showers possible into Saturday. Temperatures then warm to 83° with a little more sunshine. A ridge builds to the west over the weekend and then once again spreads east bringing the heat with it. Temperatures make it into the mid 80's on Monday and then highs in the 90's possible through midweek. However, models have been indicating that we will be on the eastern edge of the ridge. This means a couple of things for us, the first is that we won't be under the 'core' of the heat. Meaning the hottest conditions will be centered over the center of the country and we will be on the outer fringe. It will still be hot though with highs in the low 90's possible. Also, disturbances in the atmosphere like to ride along the edge of the heat - the ridge. This will allow for daily rain and storm chances, but it also plays a roll on temperatures. The less rain we see, the hotter it will get. If we end up seeing more rain, temperatures will be limited to the upper 80's. This will be what we're watching for next week as we kick off the start of August. This won't be the last of the heat, with a healthy corn crop still around, muggy and warm weather will be with us too. Funnel Clouds and Storm Pictures! 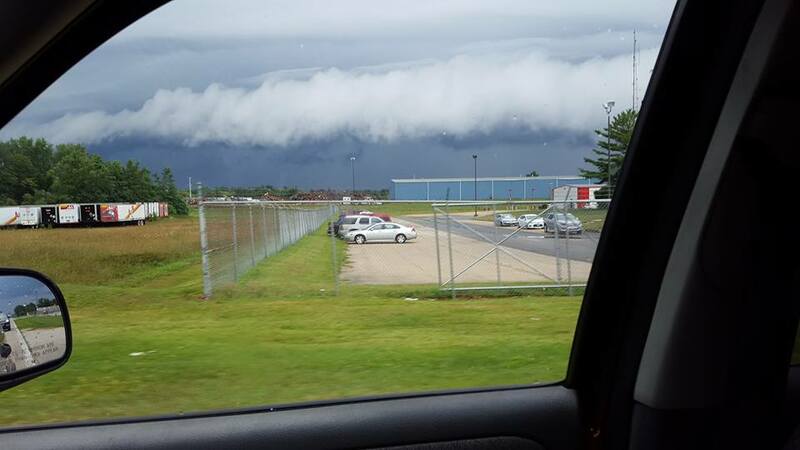 A BIG Thank You to everyone who submitted storm cloud pictures from Thursday. 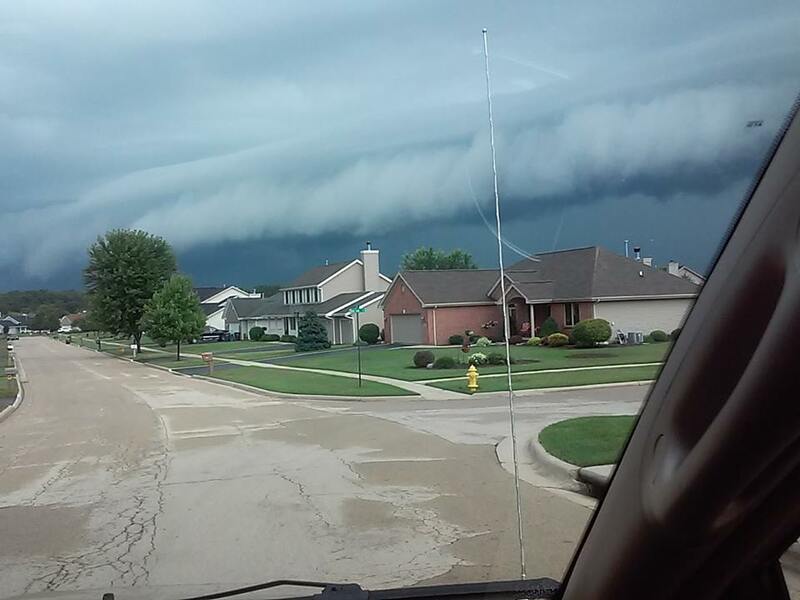 If you have any pictures you would like to send, please email them to: weather@wtvo.com. 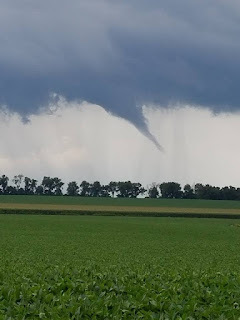 Isolated Severe Weather and Funnel Clouds Over Northern Illinois. What a messy, messy afternoon it's been for many over Northern Illinois and Southern Wisconsin. Sunshine early in the day really charged up our atmosphere for thunderstorms, some of which turned severe. 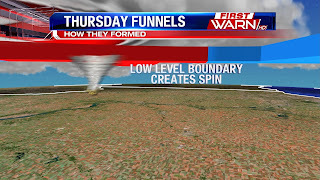 The biggest story, however, were the reports of multiple funnel clouds over Northwest Illinois early this afternoon. 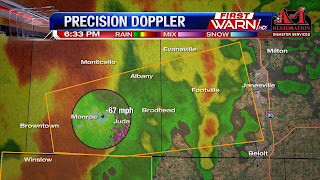 Thankfully there were no confirmed reports of tornadoes or damage, but it was enough to probably rattle some nerves. 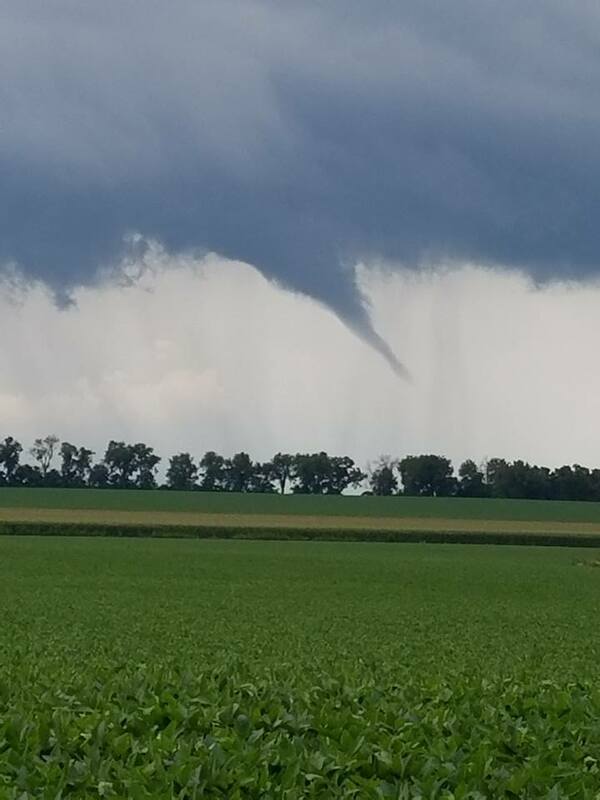 There was even enough of a strong storm to prompt a Tornado Warning for Northwest Stephenson and Northeast Jo Daviess counties a little before 3pm. 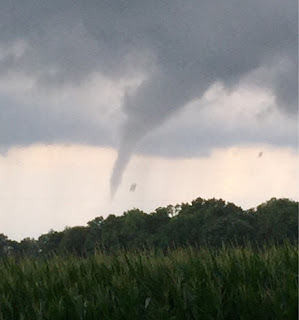 The atmosphere was not conducive for supercell thunderstorms or large tornadoes today, but there was just enough spin to generate the funnels many of you reported. Low pressure over Northwest Illinois and a stationary boundary with a cold front near the Wisconsin/Illinois border was the focal point for thunderstorms this afternoon. As the low got closer to Illinois late this morning, it caused the air ahead of it to rise. Because we had sunshine to start the day, there was enough instability to allow the rising air to turn into towering cumulus clouds and eventually thunderstorms. And since the storms were forming so close to a frontal boundary with shifting winds from south to north (south winds south of the boundary and northeast winds north of the boundary) it caused the air to spin - aided by the air already spinning around low pressure. 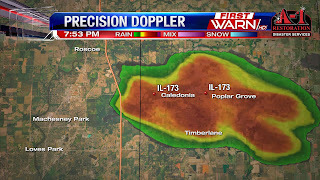 The thunderstorms that moved through were not supercellular (which is where tornadoes come from). 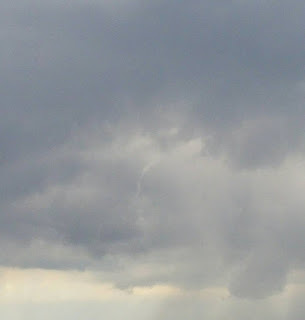 But the spinning air within these thunderstorms was enough to generate rotation, which then formed into funnel clouds. 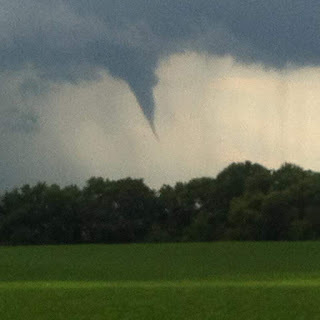 Funnel clouds like what occurred today rarely touch down. They usually come about half way down, spin like a top for a few minutes and then lift back into the cloud. There just wasn't enough large scale spin in the atmosphere to sustain the funnels. Scary to see, but most of the time harmless. With an almost same atmosphere tomorrow, we could see a repeat of thunderstorms but less in coverage. And with very little wind movement aloft, any storms that do develop will be heavy rain producers. The Severe Thunderstorm Warning for Ogle and Lee counties has been allowed to expire. 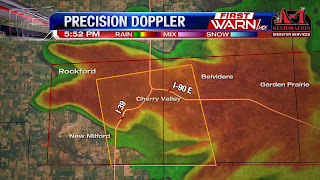 The storm that had the warning has weakened below severe limits. 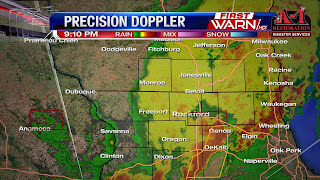 A Severe Thunderstorm Warning has been issued for Lee and Ogle counties until 6pm. 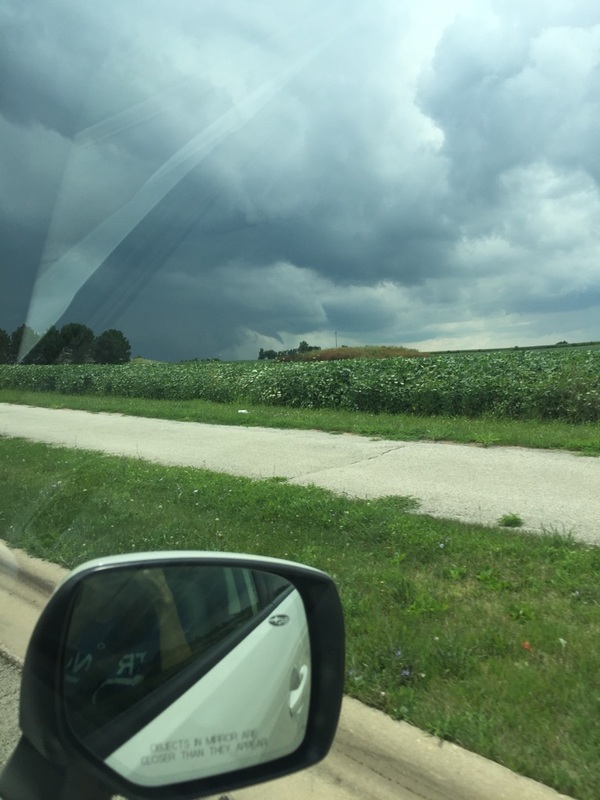 Outflow boundaries from earlier thunderstorms have allowed storms over Lee and Ogle counties to maintain their strength, if not strengthen just a little more. Biggest threat with this storm will be the locally heavy rainfall, but also large hail. There has been very weak rotation noted with this storm and given what's occurred this afternoon, we can't completely rule out funnel clouds. 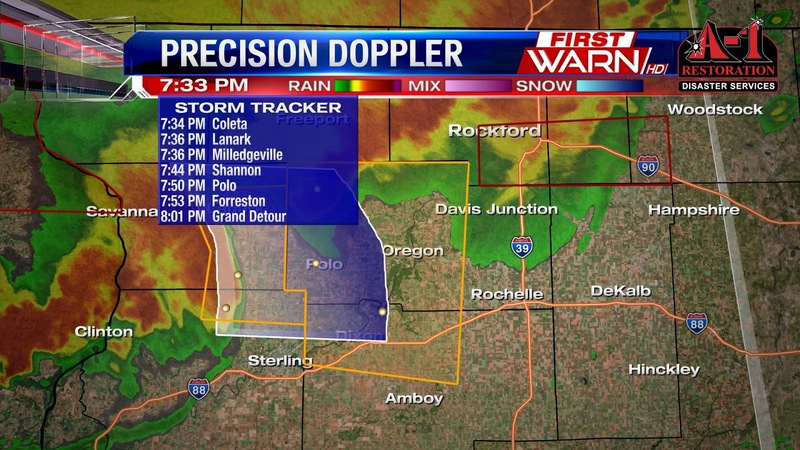 This storm is moving to the southeast at 20mph. Lost Nation and Dixon are included in the warning. Along with the Severe Thunderstorm Warning, a Flood Advisory has been issued for Ogle and Lee counties until 8:30pm. Shortly before 5:30pm, radar indicated very heavy rainfall with the slow movement of previous storms and this storm. Isolated rainfall amounts of 2 to 3 inches is possible in the Advisory area. 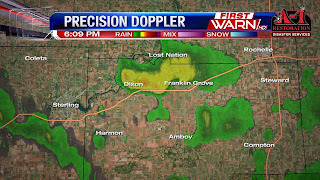 Localized flooding is possible and there was a report of ditches full and water over the road just west of the intersection of Rt 52 and US 30. Very slow moving showers and isolated thunderstorms developed Wednesday late afternoon. So slow that they prompted a Flood Advisory for Boone and Winnebago counties with nearly two inches of rain falling. This likely isn't going to produce flash flooding, but areas that typically have poor drainage and low lying areas could experience minor flooding until late tonight. To understand why these storms are moving so slow, we have to look up above our heads - at the jet stream. Winds within the jet stream during the summer months typically are not that strong. And that's why during July and August our focus shifts from the big, robust thunderstorms to heavy rain producing storms and flooding. Without much wind in the atmosphere to push these storms through, they will just sit over one area for a while and continue to produce heavy rainfall. We've actually seen this occur a few times over the past couple of weeks. 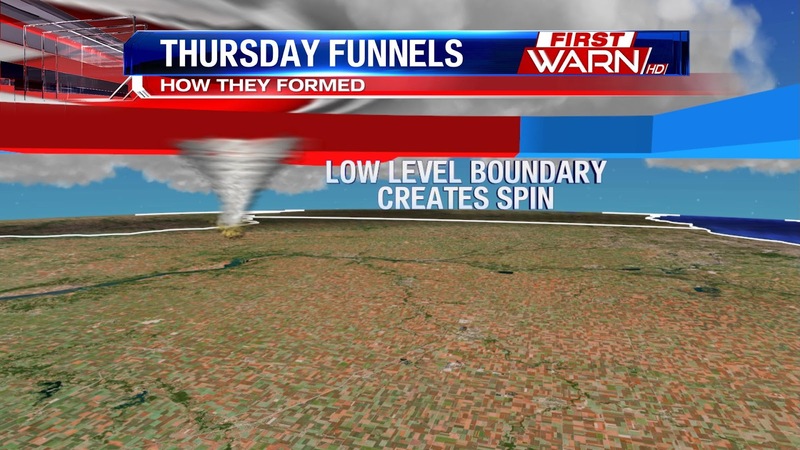 While instability won't be the greatest, thunderstorms are expected to develop Thursday. And with continued weak winds aloft those, too, could be heavy rain producing storms. So heads up for Thursday. 9:40pm Update: The Flood Advisory for Boone and Winnebago counties has been canceled. The heavy rain has ended in those counties and flooding is no longer a threat. 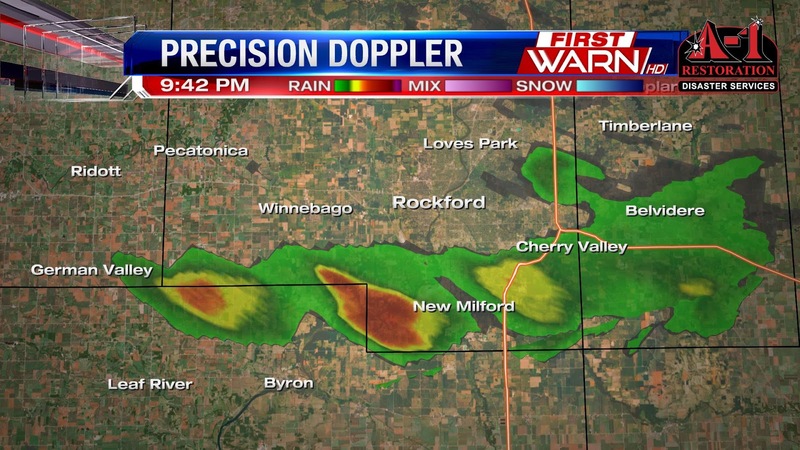 There are additional showers that have developed south of Rockford and could see heavy rainfall with those. Flood Advisory now issued for Boone County until 10:15pm. 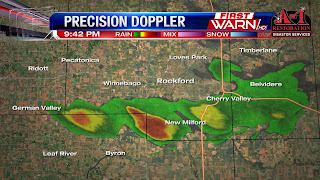 The storm that developed over Winnebago County has now slowly shifted east into Boone County, likely producing between one to two inches of rainfall. 8pm Update: The Urban and Small Stream Flood Advisory has been extended until 11:15pm. 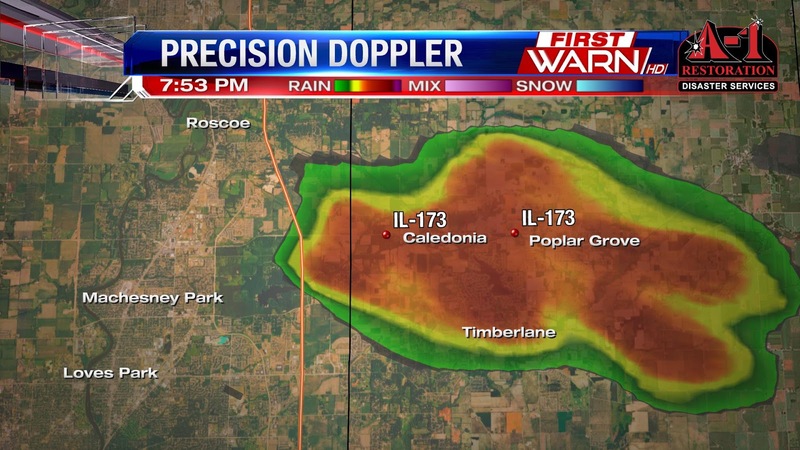 The heaviest rain core has shifted into Boone County with heavy rain occurring along IL 173 from Caledonia and Poplar Grove. 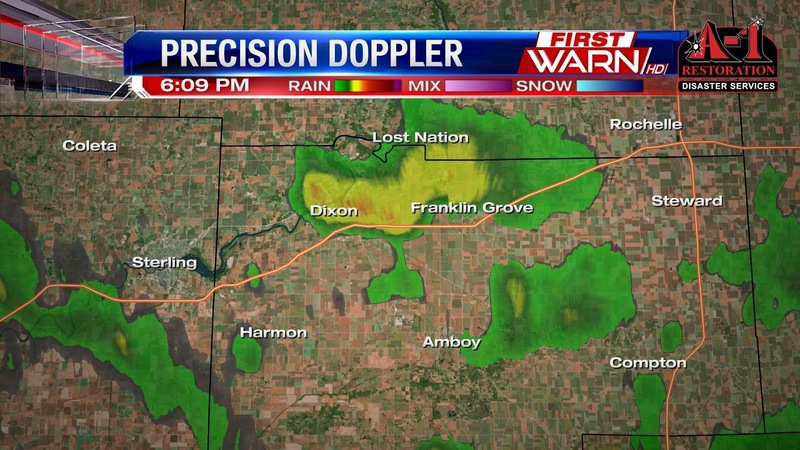 An Urban and Small Stream Flood Advisory has been issued for East-Central Winnebago County until 8:15pm. 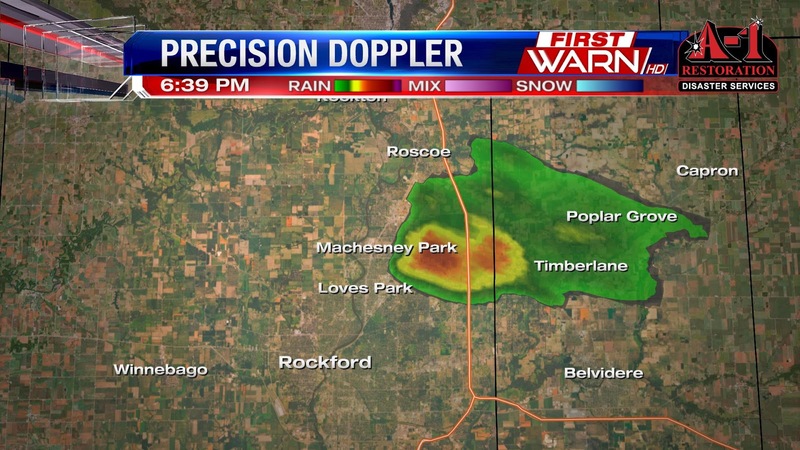 A nearly stationary rain shower near Machesney Park has produced close to one inch of rain within the past hour. Due to very light winds in the atmosphere, the heavy rain shower hasn't moved much within the past hour causing some minor flooding. Additional rainfall of up to half an inch to an inch is possible under the heaviest core. 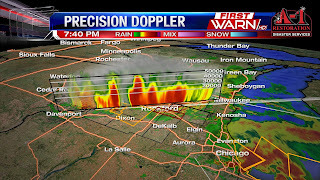 An outflow boundary from thunderstorms earlier this afternoon in Wisconsin has been slowly migrating southwest into southern Wisconsin and could help focus additional isolated showers through sunset. Then our attention will turn to the north and northwest with an advancing cold front. This will be the trigger for showers/storms Thursday afternoon and Friday. We actually caught a nice view of the rain with our MercyHealth Weather Camera in Beloit looking south. You can definitely see the tall towering cumulus cloud and heavy rainfall. This shower will continue to slowly sink south/southeast through the evening. The Lee County Fair kicks off Thursday with gates opening at noon, and continues through the weekend. If you plan to head out opening day, you'll want to keep a poncho or umbrella handy. Thursday looks to be a bit of a soggy day at times, however, the forecast gets better into the week. A passing cold front will sink south through northern Illinois Thursday morning, this will act as lift in the atmosphere to help fire up scattered showers and a few storms. With instability and shear lacking, we are not expecting a severe weather threat. Also, in the upper levels of the atmosphere there is not a lot of forcing, so its hard to pinpoint timing of the rain. With the cold front nearby expect mainly scattered showers and storms through Thursday afternoon. Winds will turn to the northwest, and this will bring temperatures into the upper 70's and low 80's for highs. Friday will be a bit drier day, but that boundary is still stalled nearby and could fire up a few showers. Saturday and Sunday look great with temperatures in the low to mid 80's and a little more sunshine. Can't rule out an isolated shower on Saturday behind a departing low pressure system, but don't expect a big impact to your day. The past couple of nights I've noticed quite a few chirps coming from crickets outside. It's actually pretty peaceful to listen to...when you're not trying to fall asleep. But did you know you can use the chirp of a cricket to get a rough estimate of what the temperature is outside? It's true! All you have to do is count the number of chirps you hear in approximately 14 seconds and then add 40 to that number. The total amount will be close to what the current temperature is outside. Crickets chirp faster when it's warm and slower when it's cooler. So give it a try! And then compare your number to the actual temperature to see how close you are! It's been warm the past two days with the high temperature reaching the middle and upper 80's, but the difference between Monday and today, and late last week has been the humidity! 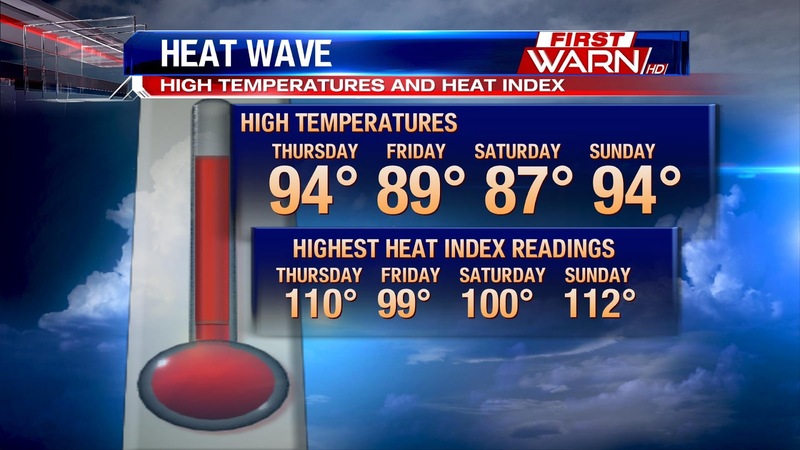 Highs Thursday and Sunday reached the low to mid 90's, but look at the highest heat index readings for those days! Either at or above 110 degrees. And if you ask me, Sunday definitely felt hotter than Thursday. 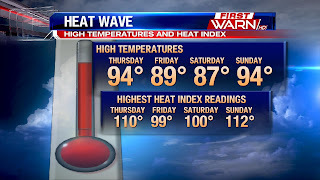 Even when the temperature didn't reach the 90's Friday and Saturday we still had a high heat index. That was all due to the extremely high amounts of moisture we had in the atmosphere. Dew points over the weekend and late last week didn't drop below the middle 70's. In fact, the highest dew point reading in Rockford was 81 degrees at 7pm on Sunday! Big time yuck! According to the National Weather Service, a dew point of 81 degrees or higher has only been observed on 22 hourly observations since 1970! The last time Rockford recorded a dew point of 81 degrees or higher was back on August 2nd, 2011. The highest dew point ever recorded was 83 degrees back on July 13th, 1995. Looking out into the extended and we could be in store for another round of heat, but not lasting quite as long. More on that to come in a later post! 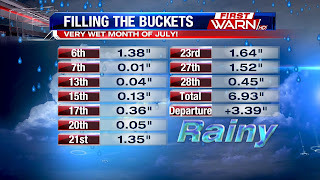 In just the past four days we've received over half of our monthly rainfall for July. And that moisture is now evaporating back into the atmosphere. 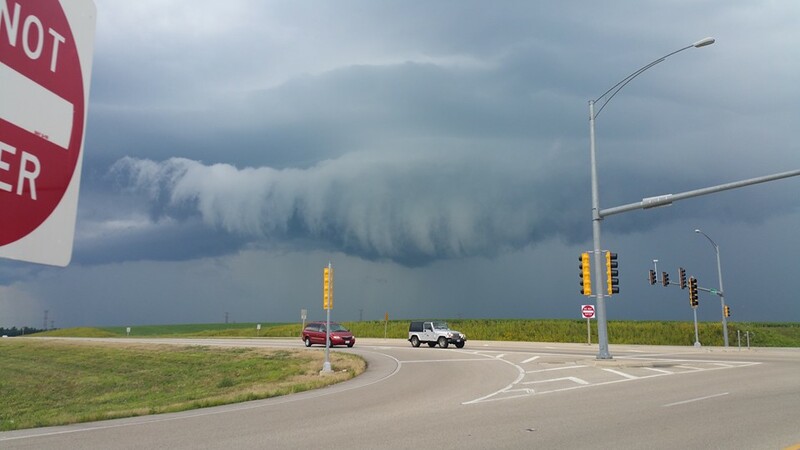 A cold front swept through Southern Wisconsin and Northern Illinois Sunday evening bringing another round of severe weather in and around Chicago. For us, it was just a few spotty showers. Behind the front came a drier air mass which helped drop our dew points from the upper 70's, to near 80 degrees, down into the low to mid 60's. A big relief from what we've recently felt. But because of the recent rainfall and maturing corn crop, our dew points won't drop much past the low 60's the next several days. With nearly three inches of rain absorbed in the soil, some of that is being evaporated back into the atmosphere with the warming sun. Also, evapotranspiration rates from surrounding corn crop have reached their peak and will continue to do so through August. So with the constant feed of moisture in the atmosphere it will be hard to get our dew points to drop much below 60 degrees. This is very typical during the heart of summer. 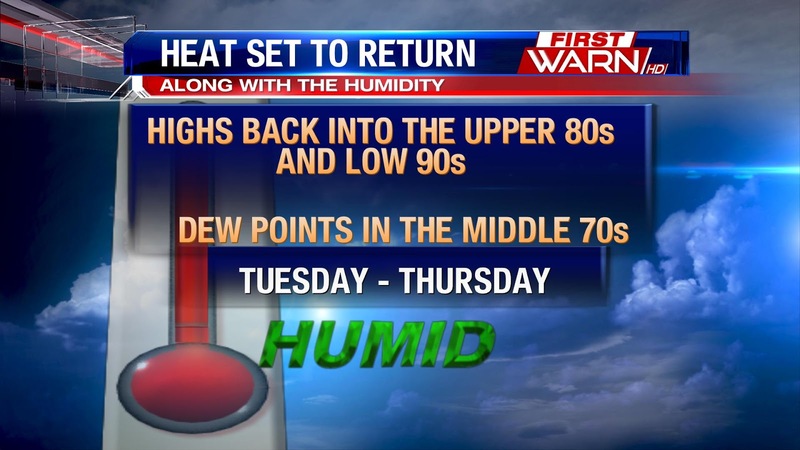 So while it won't feel like 100 degrees for a while, there will still be a little humidity in the air this week. Recent Stateline storms have really added up in the rain gauge. Rockford saw it's heaviest rain total since meteorological summer started June 1st this past Saturday. 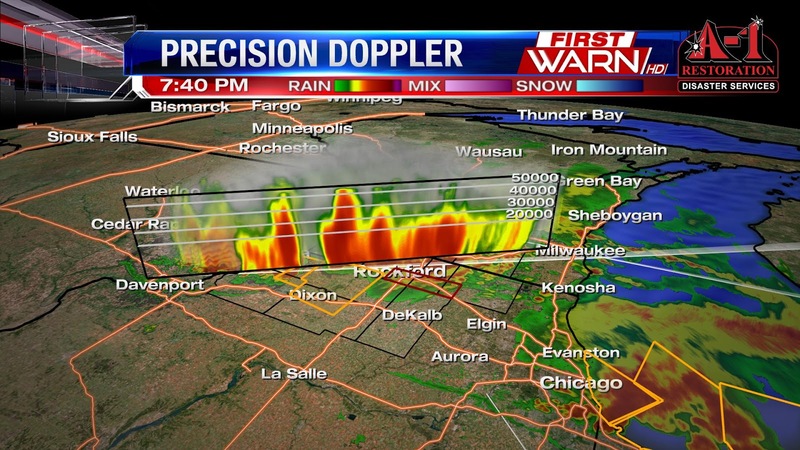 Gauges filled to 1.64" in Rockford Saturday night, as multiple storms fired up in Winnebago County. 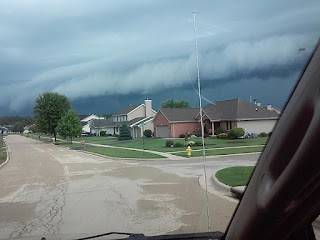 We did have multiple severe storm warnings with hail, heavy rain, and strong wind gusts reported through out northern Illinois and southern Wisconsin. 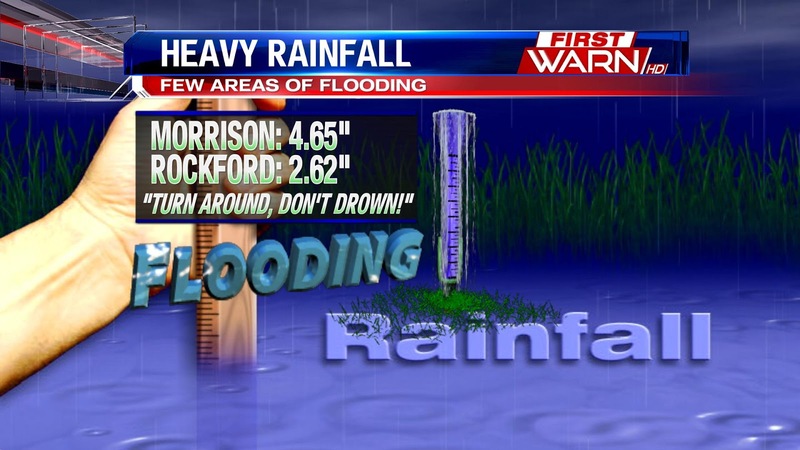 Rockford wasn't the only city to see heavy rain, some cities saw localized flooding, like Cherry Valley and Belvidere. Some areas of Boone County picked up 3-4", and we really saw the flooding near I-39 and 20. Boone county is in need of the rain, last week's drought monitor has Boone and Mchenry counties highlighted under the 'abnormally dry' category. 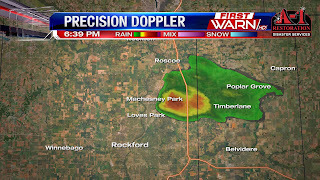 Rockford's recent rain really helped out the summer's rainfall need, because June was about two inches dry. For the month of July Rockford has a surplus of rain, the month to date total at 4.96" which is 1.94" above average. Overall since June 1st we are still .52" shy of the average with a total of 7.15." We get a few dry days ahead before scattered showers and storms will be possible to close the week. Enjoy a few 'beach days' with seasonable temperatures and humidity, with highs in the mid and upper 80's. Thunderstorms have had a hard time developing Sunday evening despite a cool front moving through. Most of the thunderstorms have developed over Chicago and areas south. 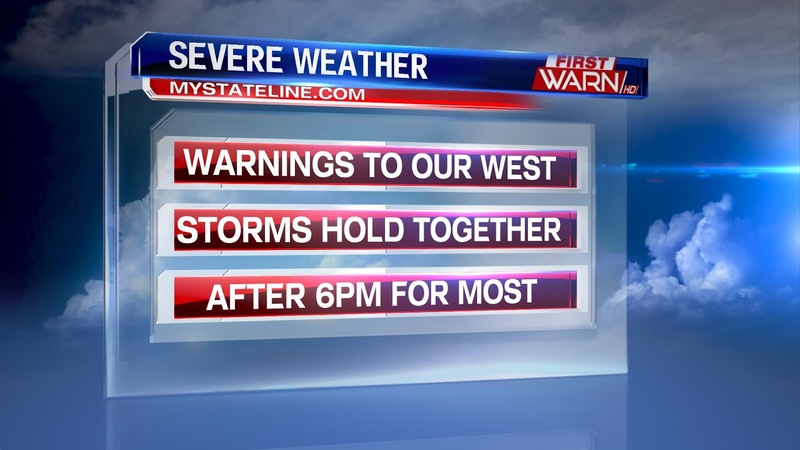 And with every hour that passes our storm threat will continue to decrease through the evening. Monday getting rid of the high humidity we've felt the past several days. High temperatures will remain seasonable in the middle 80's, but dew points will be more tolerable in the low to mid 60's for the upcoming week. 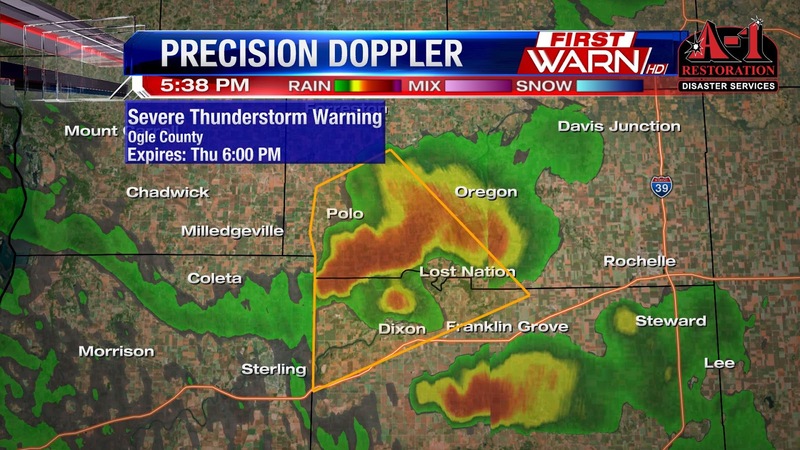 Severe Thunderstorm Warning will expire at 9:30pm for DeKalb and Lee Counties. 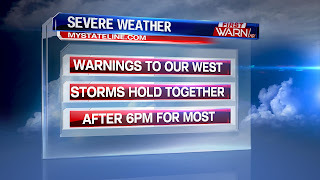 Otherwise, our severe threat is over as the Severe Thunderstorm Watch has already begun being canceled in our western and northern counties. We still have a few hours left of moderate to heavy rainfall and lightning, but the severe weather threat is over. 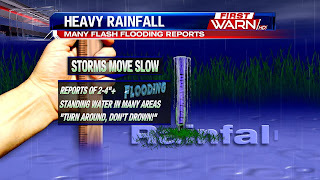 The rain that fell was very heavy, leading to many areas seeing flooding concerns. In fact, some locations have reported 2-4" of rain. That led to several reports of standing water, high water, and even an intersection being washed out in Lena. Per the Rockford Scanner, a water rescue occurred in Belvidere. Remember to never approach an area that you think is flooded as it does not take much water to cause a vehicle to stall out! 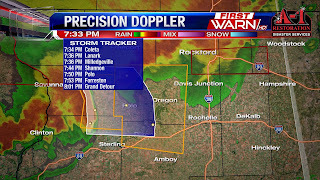 SEVERE T-STORM WARNING for Ogle and Lee Counties until 8:15pm for 60mph wind gusts/nickel sized hail. 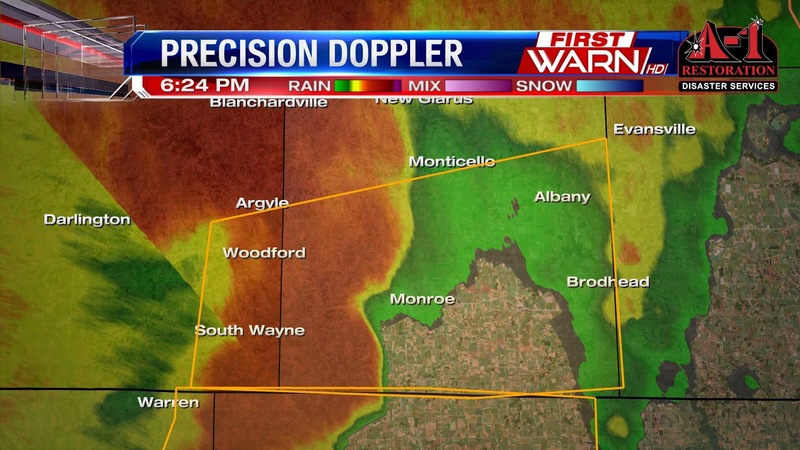 Severe Thunderstorm Warning for Carroll and Whiteside Co until 8pm. 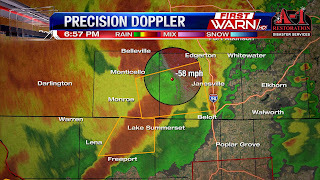 Expect 60 mph wind gusts. Flash Flood Warning continues for Winnebago, Boone, McHenry Co. 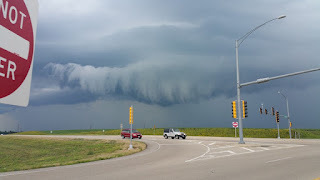 Heavy rain along 39 and 90.
from any thunderstorms that move in will include damaging winds (70-80mph wind gusts already recorded in Iowa), large hail, isolated tornadoes, and very heavy rainfall. 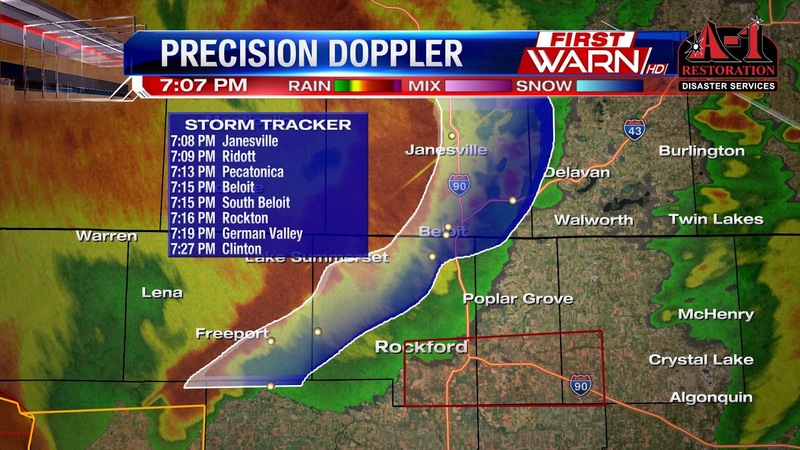 The storms will likely arrive after 5pm near Dubuque, Iowa and closer to 7pm in Rockford and along the I-39 corridor. 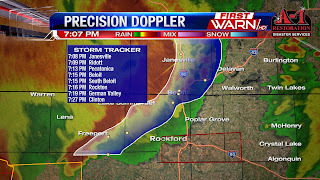 They are expected to maintain their intensity as they move east towards the Stateline. 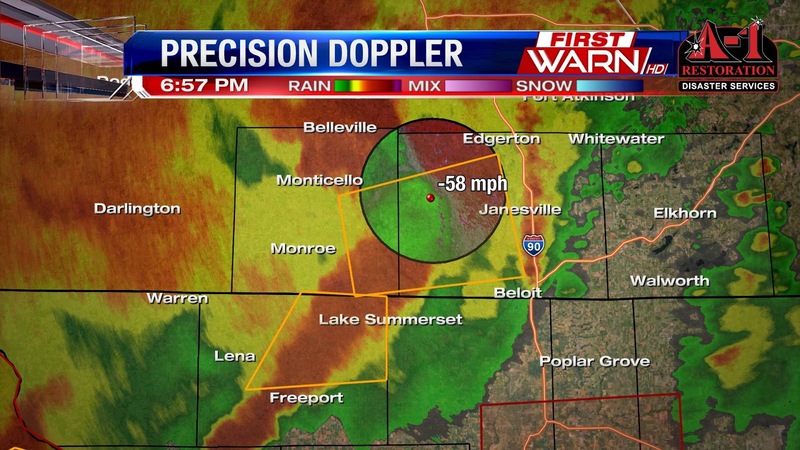 Winds of 70-80mph have already been reported near Hazleton, Iowa. The storms will likely continue to develop further south in Iowa, meaning everyone in the northern Illinois will likely get in on strong to severe thunderstorms. Storms possible Wednesday before Heat Arrives.